Sirius Payroll is a complete payroll system that provides you with easy input; comprehensive reporting including union and benefit reports, labor distribution, and quarterly and annual tax reports; checks; and complete multi-year history of checks and input. Multiple pay frequencies (weekly, biweekly, semimonthly, monthly) can all be processed during one run. 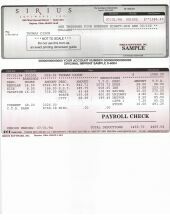 The Payroll application easily handles multiple pay rates, prevailing wages, multiple state taxes, multiple local taxes, special pay, standard deductions, and special deductions for each employee.